If there's one line that I can remember from my elementary school life, that would be that line above. I was on my last school year then when my teacher kept reminding us about this thought, and now, as I received this wonderful news from our Ayala friends, it is indeed true. This year, in partnership with Ayala Foundation Inc., NUVALI, the evoliving community that's converging nature, people, and technology is putting up the greenest fair of the year - Ayala Recyclables Fair 2011. This earth-friendly event will happen every third month starting this coming February 19, 2011. 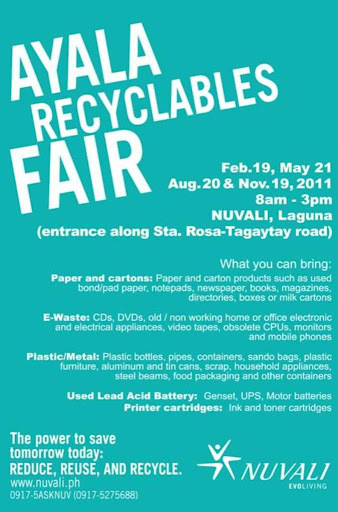 So, on February 19, May 21, August 20 and November 19, from 8 in the morning til 3 in the afternoon, you can bring recyclable materials at NUVALI, Laguna and exchange it for some cash.